Looking for big impact in the middle rounds of your draft? Scott White says these players are poised to make a leap. Want more sleepers for your Fantasy draft? Head to SportsLine.com and check out the all-new ACES metric to find overlooked starting pitchers. You'll find some names from this list ranked surprisingly high. Breakouts are a little different from sleepers. They're already established a certain level of value but are poised to build on it. If you're the sort of nut who enjoys reading up on Fantasy Baseball in January, then you saw some of these same names and arguments the first time around. But with the additions here in Version 2.0, I've tried to narrow the focus to those with impact potential. It's not just that they're likely to outperform their draft position. It's that they have the upside to blow it away. Because that's what you really want in the middle-round range, right? No need to play it safe anymore with your nucleus already intact. We'll begin, though, with more of an early-rounder who nonetheless is uniquely equipped to blow his ADP away. Shane Bieber already stood out among rookie pitchers last year for his control and efficiency, looking like a poor man's Rick Porcello with room to grow from there. And his development of a changeup this offseason may be the key to unlocking that potential. It has drawn rave reviews this spring, pairing with his swing-and-miss slider to deliver one of the most impressive stat lines of the exhibition season. And seeing as lefties crushed him to the tune of a .316 batting average and .909 OPS last year, it's exactly what he needs to shore up his greatest weakness. The Indians have a history of maximizing their pitchers' potential, given that none of Corey Kluber, Carlos Carrasco, Trevor Bauer or Mike Clevinger were exactly can't-miss when they arrived on the scene. If things continue to play out this way for Bieber, though, it's yet another success story. The Padres think Matt Strahm's four-pitch mix will play even better in a starting role than it did in a relief role, and you see the success he had out of the bullpen last year. The results so far this spring back it up. A quick turnaround after knee surgery prevented him from trying his hand as a starter last year, at least in a traditional sense, but it's the role the Padres envisioned for him all along. "Yes, it is a starter's arsenal," pitching coach Darren Balsley told MLB.com at the start of spring training. "It's about endurance and health, and that's it. There is no doubt in my mind that he can be a very good starter in the big leagues." I've made a lot of noise about Adalberto Mondesi already this draft prep season, even writing a full-length piece arguing why he's the most pivotal player in Rotisserie and Head-to-Head categories leagues this season. But through it all, I've missed the obvious: If he's all that I say he is, he's in for a loud breakout. Just double the numbers, giving him a full season's worth of at-bats, and he's at 28 homers and 64 steals — a combination no other player in this year's pool is capable of. Of course, no one's drafting him for those numbers, given his lack of track record. So it becomes a question of how much you're willing to hedge knowing it could mean passing up a player who provides a uniquely efficient path to 5x5 success. And me, I'm having a hard time finding any obvious red flags in the profile. The speed is a given on a Royals team built to run. The power was a continuation of a breakthrough that began in the minors in 2017. Maybe the batting average could fall, but then again, a .335 BABIP isn't so absurd for a player with his foot speed. Even if you scale back the numbers to a .250 batting average, 20 homers and 50 steals, that's still a monster contributor in an environment where steals are scarce. It's no secret Yasiel Puig is a trendy pick within the industry, so I'll acknowledge his inclusion here may be overdue. But I want to make clear just how much upside we're talking here, because it's enormous. He's going to one of the most hitter-friendly venues in all of baseball. We saw what kind of impact that sort of move can have with Christian Yelich last year, and while I don't think the difference here is as stark, it's worth pointing out Puig hit 17 of his 23 home runs on the road last year, producing a .965 OPS. He's joining a team that sought him out in a trade and, thus, won't be implementing him in the same reluctant way the Dodgers did, frequently moving him in and out of the lineup like he was some sort of burden to be managed. He's joining a team that considers him a focal point of the lineup and not someone to bury in the seven or eight hole. Even when the Dodgers played him the past couple years, that's often where they put him, which is a big reason why he hasn't gotten 500 at-bats in a season since 2014. All of his numbers should rise with his move up the lineup, but especially the runs and RBI because of the quality of the hitters batting around him. Any one of those details on its own would be a pretty strong argument for a breakout, but combining the three — the venue change, the role change and the new spot in the batting order — makes a 30-homer, 20-steal prediction sound like just a starting point. You don't have to squint too hard to see the upside for Jon Gray, who had the 16th-best K/9 among qualifying pitchers last year and the 19th-best swinging strike rate. And just by doing a simple FIP check, you can surmise that his ERA probably should have been a run lower than it was. Those numbers become even more impressive, though, when you consider what a mess he was last year, his mechanics and approach being so out of whack that he even got sent down for a spell in July. He got back to a more comfortable playing weight this offseason — up to 235 from 209 — and already there's optimism this spring that he's throwing his fastball with renewed conviction and the slider is again playing up. But to put it more directly, Gray is a breakout candidate because he's a big bat-misser who has shown the capacity to pitch six or seven innings at a time, doing so 16 times last year even with all the starts when the Rockies had to pull him early because he was so bad. That combination is getting harder to find in today's game, and a staff full of that kind of pitcher should carry you far. Gray is your chance to get one much later than most. As a rookie last year, Jordan Hicks overtook Aroldis Chapman's near decade-long reign as the hardest thrower in baseball, averaging nearly 102 mph on his fastball. Yes, averaging. Of course, his fledgling arsenal made it not so effective, but that's quickly changing thanks to the continued development of what now looks like a pretty wicked slider. He's making a concerted effort to feature it more and has missed bats with much greater frequency this spring. It's just a small glimpse of what may be in store after the Cardinals spent the entire offseason talking up Hicks' potential as a closer. While the official stance is "play the matchups," which is made possible by the signing of lefty Andrew Miller, it sounds like manager MIke Shildt wants to make Miller the more flexible of the two, as he was in Cleveland, which opens the door for Hicks to get maybe 30-plus saves in an environment where fewer and fewer 30-saves guys are available. Knowing his ability foundation, I don't think it's a stretch to say he has top-five potential as a closer. German Marquez's 2018 numbers certainly aren't lost on anyone, and maybe were enough of a breakout for some, but what they sell short is just how good he was once he got good. It was a tale-of-two-seasons scenario in which the 23-year-old delivered a 5.53 ERA, 1.55 WHIP and 9.1 strikeouts per nine innings over his first 16 starts compared to a 2.47 ERA, 0.95 WHIP and 11.6 strikeouts per nine innings over his final 17, making it safe to assume an actual skill change occurred that renders those early numbers obsolete. The pitch data supports the narrative that some mechanical tweaks unlocked his true potential. He learned to avoid slowing down his delivery on his offspeed pitches, and in doing so transformed his slider and curveball into elite swing-and-miss offerings. There will be some reluctance to draft Marquez both because owners instinctively distrust developments they didn't see coming and because he pitches at Coors Field, which has a unique ability to expose warts and amplify mistakes. But considering the upside, investing in Marquez after the top 20 are off the board seems like a worthwhile risk. After losing all of 2017 to a strained rib cage, David Dahl missed the middle two months last season with a fractured foot, and even when healthy, the Rockies hesitated to make him a regular part of their lineup. The wait didn't deliver the expected payoff, in other words, which has limited the hype now that he's finally poised to step into an everyday role. Many of the extraneous outfielders the Rockies employed last year, most notably Carlos Gonzalez, are gone, and Dahl did enough in a part-time role to earn a larger portion of the pie now. You could even argue his .311 BABIP was low by Coors Field standards, given that its expansive outfield allows for more batted balls to drop (Rockies hitters have a .339 BABIP over the past decade at Coors). Credit Dahl with another 15-20 points of batting average, and he starts to look a lot like Charlie Blackmon — a welcome comparison for a player you're likely to draft as your third outfielder. Few players in major-league history have managed to hold down a job with the 35 percent strikeout rate that has become the norm for Joey Gallo, so nobody bats an eye when he bats .200. But there are actually two factors contributing to the awful batting average: the strikeouts, yes, but also an extreme fly-ball tendency that, while theoretically boosting his power, also means he's too often hitting into easy outs — something that someone who so rarely makes contact simply can't afford to do. And the reality is that he probably doesn't have to sell out for power, given how hard he hits the ball. Gallo himself seemed to realize it in the second half, trading off some of those fly balls for an elite line-drive rate. His BABIP then rose from .228 to a more reasonable .286 and his batting average from .187 to .239. A .240 batting average may not sound so great on its own, but for Gallo it's like the difference between being a .265 hitter and a .300 hitter. It gives him a fighting chance of muscling his way into the top five at first base with numbers more like those of a third-rounder than a eighth- or ninth-rounder. The trouble with projecting a starting pitcher breakout in today's landscape is that pitchers no longer adhere to the conventional formula of gradually adding innings to what's a fairly obvious talent base. More and more organizations are deciding there's no need to push them beyond where they already are, thereby inflating the value of the few established innings eaters while turning the rest of the position into a mangled, unpredictable mess. But Jack Flaherty's numbers the third time through a batting order last year were about as good as the first and second time through, which suggests he's capable of sustaining the same effort level deep into games with a complete enough arsenal to keep hitters guessing. The times he went only five innings were usually a product of inefficiency — i.e., not throwing enough strikes — which is something you can reasonably expect to improve with experience. Flaherty fits the traditional breakout model of having the capacity to take on a bigger workload while flashing big-time talent, namely two elite breaking balls that contributed to him having the ninth-best swinging strike rate among all qualifiers last year. It's not altogether wrong to say Jurickson Profar already broke out last year after a myriad of injuries and missed opportunities came dangerously close to wrecking the one-time top prospect in baseball. But a closer look reveals he was actually unlucky, his .269 BABIP ranking 116th among the 140 qualifiers. Sometimes a low BABIP is justified, asn Gallo's case thanks to all the fly balls, but Profar ranks in the middle of the pack in both fly-ball rate (bad for BABIP) and line-drive rate (good for BABIP). He should, then, rank in the middle of the pack in BABIP, profiling as more like a .285 hitter who controls the strike zone with emerging power. In line to be the Athletics' second baseman, he's on the verge of quadruple eligibility and perhaps another jump in production, his bat beginning to resemble that of Anthony Rendon. The threshold for a Luis Castillo breakout is only lower after he fell short of those hopes a year ago, but many of the traits that prompted the initial enthusiasm remain intact. He still has a fastball pushing triple digits regularly and still has a changeup ranking among the best swing-and-miss pitches in baseball. 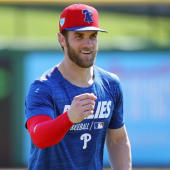 His issues were more related to consistency, both in terms of mechanics and pitch location, which explains the extreme highs and lows he experienced throughout the season; his ERA went from 7.85 in April to 3.48 in May to 6.75 in June to 2.25 in July to 5.57 in August, before finishing strong with a 1.09 mark in September. Castillo ended the season on his highest note, and because he tends more toward ground balls and hasn't shown any major control issues, he's too optimized for today's three-true-outcomes environment to remain just a middling performer. Coming off a type of shoulder surgery that was completely untested within the hitter ranks but has historically left pitchers fighting for their careers, it's understandable that Michael Conforto didn't look like himself out of the gate. But his .273 batting average and .895 OPS in the second half were basically in line with the .279 batting average and .939 OPS he delivered in 2017, right down to the BABIP and home run-to-fly ball rate, so there's ample reason to believe it's his truer form. And that form was good for 3.40 H2H points per game, which would have landed him right between Juan Soto and Aaron Judge if applied over a full season. Nick Pivetta's FIP was nearly a run lower than his ERA in 2018, which right off the bat suggests he had some bad luck, suffering at the hands of a league-worst defense and inflated BABIP. In the areas over which he has the most control, though, he took a big step forward, his 10.3 strikeouts per nine innings ranking 11th among qualifiers, with his 3.69 strikeout-to-walk ratio ranking 21st. Plus, the FIP itself wasn't totally pure, having been inflated by one of the worst home run-to-fly ball rates in the game. Bad luck all around, right? Between the Phillies' efforts this offseason to shore up their defense and good, old-fashioned statistical regression, Pivetta isn't such a long shot for Carlos Carrasco-type numbers in his third major-league season. Though his talents were plainly evident, the Pirates never seemed content to let Tyler Glasnow do his thing, encouraging him to induce contact early in the count with a two-seam fastball rather than tackling his efficiency issues head-on. The Rays took the opposite approach upon acquiring Glasnow at last year's trade deadline, and the results were immediate. His strike percentage jumped from 59.4 with Pittsburgh, where he was pitching out of the bullpen, to 63.4 with the Rays, resulting in a not-so-terrible 3.1 walks per nine innings. And, as expected, his high-90s fastball and high-spin curveball missed bats by the bundle. The only issue was an elevated home run rate that his heavy reliance on a curveball should help combat. Even if it doesn't and he's destined for a 4.00 ERA, he'll make an impact as a guy who delivers between six and 10 strikeouts every time out. Meanwhile, H2H points owners will get to enjoy his relief pitcher eligibility for another year. Normally a season-ending shoulder surgery isn't an encouraging development for a player, but Jesse Winker put a positive spin on his by revealing he had been playing through a torn labrum for a couple years. That timeline corresponds with his sudden loss of power in the minors, where he hit 36 home runs in his first 927 at-bats but only 20 in his final 1,135. What's more interesting is he was finding his power stroke in the majors regardless, something that tends to happen for prospects with a plus hit tool when they get called up and are actually given pitches to hit. All seven of his home runs came in his final 45 games, during which he batted .348 with a 1.005 OPS and more walks (29) than strikeouts (22). Did I mention the plus hit tool? Yes, WInker has always been a remarkably patient hitter, but the Joey Votto comparisons only begin there. In everything from his line-drive rate to his fly-ball rate to his hard-hit rate to how often he pulls the ball or hits it the other way, he profiles exactly like the franchise icon, whose batted-ball tendencies have routinely delivered him BABIPs in the .350 range. It's like the Reds took their best player and cloned him, which puts pesky matters like shoulder surgeries in proper perspective. Plus, there are no limitations on him this spring. In fact, new manager David Bell has hinted at making him the everyday leadoff man, which would mean at-bats aplenty for a player who some feared might face competition from newcomer Matt Kemp. Apparently not. Technically, Tyler Skaggs is more like a bounce-back candidate than a breakout candidate given that his breakout was plainly evident for the first two-thirds of last year. But the crash came so suddenly and so spectacularly that it's safe to assume those who didn't own him don't even remember he had a 2.62 ERA on July 30. He made the mistake of pitching through a groin injury that day, giving up 10 earned runs in 3 1/3 innings, and then compounded the mistake by returning too soon from the DL and giving up seven earned runs in 3 1/3 innings. He'd make three more appearances after another DL stint, but he was never right after the initial injury, which is why his numbers wound up where they did. The guy who put together a 2.62 ERA through 19 starts, though, did so with a .313 BABIP and 2.94 FIP. He offered little reason to doubt what he was doing, so unless you doubt what fouled it all up, you can trust you're getting a major contributor again. For most of his career with the Dodgers, Marlins and Yankees, Nathan Eovaldi was the poster boy for toothless velocity, consistently ranking among the hardest throwing pitchers yet failing to miss bats regularly. Things changed, though, once those darling Rays got their hands on him, convincing him to curtail the use of his slider in favor of a cutter, which doesn't break as much and looks more like his fastball coming out of his hand. And that was precisely the point: His fastball lacked deception, so they tweaked his arsenal to give it some and it immediately became one of the majors' best at coaxing swings and misses, doing so about 12 percent of the time compared to only 7 percent previously. It didn't transform him into some elite bat-misser, no, but the 8.2-per-nine-inning strikeout rate was a career-best, as were more or less all his numbers. It earned him a big payday from the Red Sox, who could make him a winner on the level of a Rick Porcello if he can just keep a steady hand. Reason for removal: While I do think it's possible, perhaps even likely, Eovaldi puts up career-best numbers this year, I feel like the term "breakout' connotes a higher ceiling than I'm willing to grant him, seeing as his adjustments last year still put him at less than a strikeout-per-inning. I mean, here I am hoping for a Porcello-like outcome from a player who so clearly lacks Porcello's greatest strength, durability. That's a tough sell for many — including myself, it turns out, since I have yet to select Eovaldi in a draft of any kind. Turns out there are more interesting pitchers available in the same range he's going, including breakout picks Pivetta, Glasnow and Gray. So which potential Fantasy Baseball breakouts should you be targeting? And which player is a must-draft? Visit SportsLine now to get 2019 Fantasy Baseball rankings for every single position, all from the model that called Khris Davis' huge breakout season, and find out.